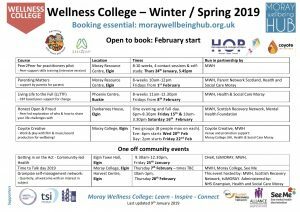 With courses starting this January and throughout the season, Moray Wellbeing Hub and our partners are delighted to announce a range of courses to book. Including Living Life to The Full, Peer2Peer, Parenting Matters, Honest Open and Proud, as well as creative film and sound production for wellbeing. all courses are free with a booking fee of £5 (refundable for most courses). Anyone can book – just get online and select a course that suits you!